There are three words that describe the new “Catch a Wave” exhibit hosted by the Florida Museum of Natural History at the University of Florida: totally gnarly, bro. 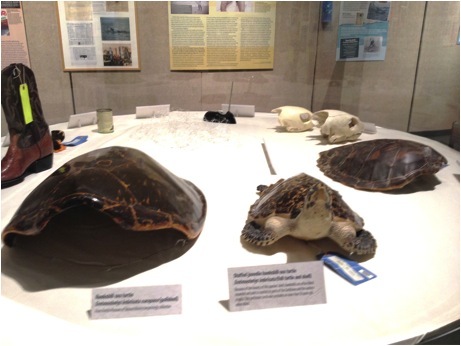 The exhibit, which is the closest thing Gainesville residents have to the beach, includes vivid pictures, real-life specimens and hands-on activities. Visitors can almost feel the sand between their toes without the need for sunscreen. 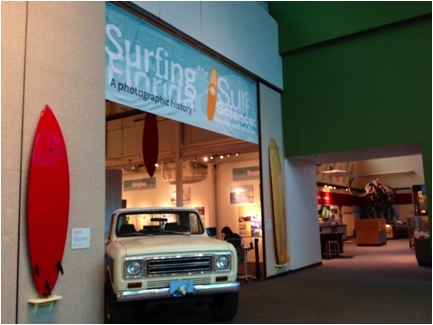 ‘Catch a Wave’ is a collaboration between Florida Atlantic University in Boca Raton, UF and the museum. 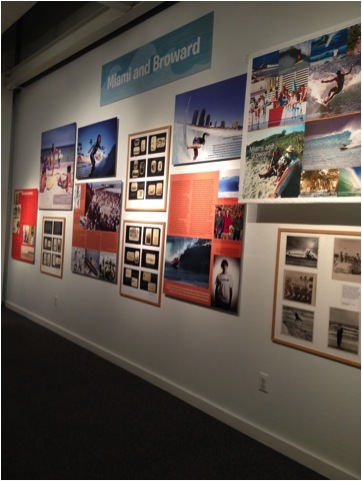 “Surfing Florida: A Photographic History” is a traveling exhibit originating from FAU’s College of Arts and Letters. 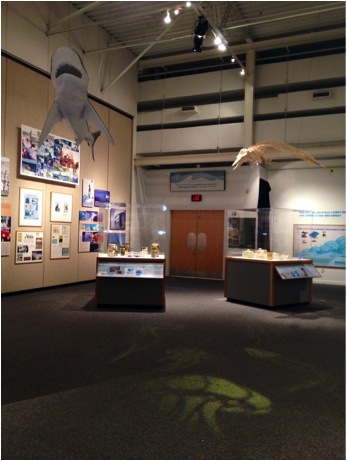 UF and museum scientists contributed to the exhibit by adding a second part, “Surf Science: Waves and Wildlife,” which includes a full-scale shark model, a dolphin skeleton and a display of different Florida beach sands. Catherine Ward Carey, public program coordinator at the Florida Museum of Natural History, said the museum wanted to add to FAU’s exhibit by including an educational component. “It was primarily a photographic exhibit, and then we’ve augmented it with natural history including surfing, snails, information on sea turtles and all sorts of cool things that are in the water with us,” Carey said. Laura Caicedo, a marketing intern at the museum, said the wave maker–an activity that helps teach visitors the science behind a wave–is her favorite part of the exhibit. 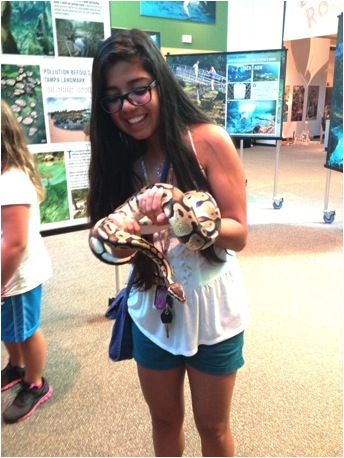 “It’s [the exhibit] a lot different than what we’ve had before,” Caicedo said. Visitors can also find out their odds of getting a shark bite by visiting the museum’s famed International Shark Attack File, the longest running database on shark attacks. John Wilson, a 19-year-old industrial engineering sophomore, said he decided to visit the exhibit because he has been surfing since he was 9 years old. 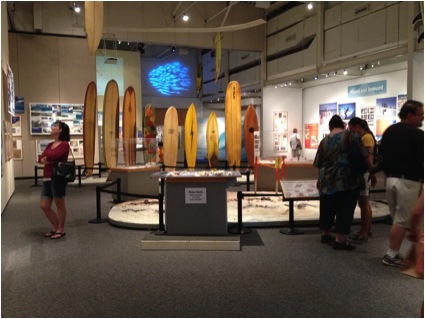 Wilson said that the exhibit did a good job of showing beaches from the surfer’s point of view while explaining the science behind a Floridian’s favorite place. He said he will be going back later this week. Carey said the main purpose of this exhibit is to give Floridians a better understanding of their environment, particularly the beaches. “With anything we do, we hope for a better appreciation and awareness of the natural world around us,” Carey said. “We do tend to focus our day-to-day living without noticing what’s at the beach,” Carey said. The exhibit will run until January 20th, 2014. Admission is $4 for adults, $3.50 for Florida residents and seniors, $3 for children ages 3-17 and free to UF students with a valid Gator 1 card and museum members.